…they were a very very good ball club. Almost every one of their hitters was a home-run threat and considering how the wind had a tendency to blow out to right field, it happened quit often during our series against them. Suffice to say I had an incredible time rubbing elbows with a ball club that produced the quality of athlete that competed at FAU. Fun times! Many thanks to Rich Billings for taking the time to share with us what Florida Atlantic looks for future talent and what you can do to stick out on the field and showcase your talents! Please let me know what you thought of the interview in the comment section below. Even if it’s just to say hi, I’d love to hear from you! 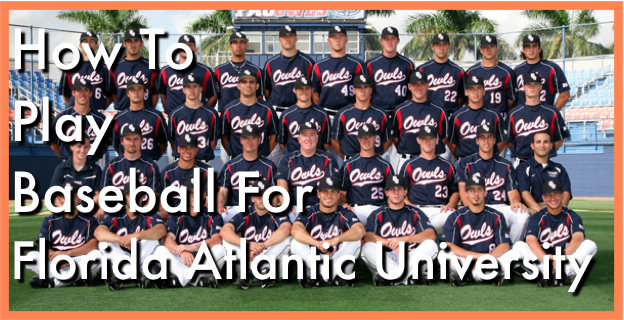 Learn more about the FAU baseball camps here! Next post: Crush The Ball Like Chris Davis & Make It Look Easy.